I have an ASUS WL-520GU wireless router with four LAN ports. When my laptop is running Windows 7, and I make a wired connection from the laptop to the router, the laptop does not get an IP address. The network and sharing center calls it a "Public Network" with "Limited Access" and when clicking 'status' it says that there is no ip address for IPv4 nor IPv6. 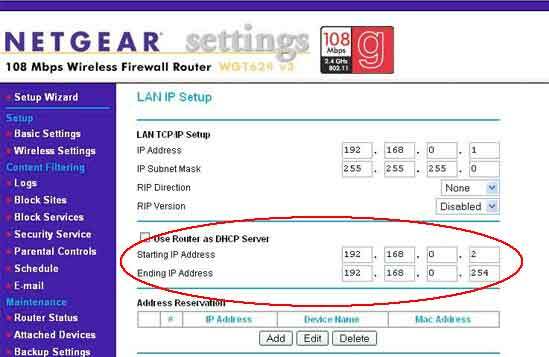 I have repeated the experiment several times: reset router to factory settings, connect no other device with lan nor wan, connect laptop in question, get no IP address. I have just realized that the behavior is not as regular and predictable as I first thought. It seems that the router has problems in general with DHCP. I have tried, within the last few days, without any restarts of the router, that one laptop said upon login that the IP was already used by another PC. I was not able to get an IP with neither wired nor wifi. I tried several times. Suddenly (without restart or reset) when both WiFi and Wired connection was established I got an IP address. I restarted the router but now I kept getting IP addresses successfully with both wired and WiFi, ie could not provoke the problem. In short, I can't really see a pattern in this behavior. Once you are absolutely sure that no devices have static IP addresses, make sure that your router has no DHCP reservations. Press windows key + R and type "cmd" into the textfield, then press Enter. This should be enough to fix the issue, but if not please post your "ipconfig /all" results please. Not the answer you're looking for? Browse other questions tagged windows-7 dhcp or ask your own question.